Millions of people want to start blogs. Every year, millions of people do. And every year, millions of them fail. Why? People often look at blogging and think it’s easy. And they’re right, it does look easy. But easy it isn’t, not if you don’t know what you’re doing. If you want to start a blog as a hobby, you can learn as you go–not much hangs in the balance. But if you want your blog to be an income earning- or business-promoting venture, you’ll want to get it up and running quickly, at minimal cost and with the fewest site-killing mistakes. 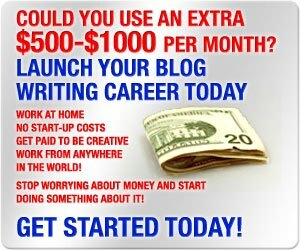 I’m telling you from my own experience, especially if you have no IT-related experience, creating a money making blog is a very long trip up a very large hill. You shouldn’t go it alone. It’s said that “experience is the best teacher”, but the only comfort in that notion is when you have some experience under your belt. When you’re early on and don’t have it, you have nothing to fall back on, so you stumble through the dark, make mistakes and hope it all turns out OK. The problem with this approach is that takes time to make it happen, if it ever does. In the meantime, you waste a lot of time on efforts that were never going to work, you spend money trying to cover your mistakes, and eventually, you might even get discouraged and abandon the effort. That’s the hard way, and the way that leads to failure in most cases. The easier way is to benefit from the knowledge of those who have the experience. Blogging is very competitive today, and if you’re to have any chance of succeeding at it, you need to get help. Most beginning bloggers need a mentor, but the problem is who do you know who’s actually succeeding at blogging in a financial sense? Probably no one, or at least no one who will work with you closely. Plan B: get into a mentor-equivalent program. Bob Lotich* and Jonathan Milligan have put together the three part Blogging Your Passion University series that will give you everything you need to start a successful blog of your own, and to grow it in the future. Get this program, and you can reduce your start up time from a year or more, to just a few weeks or months. If I had a program like this available to me when I started OutOfYourRut I’d have taken advantage of it! How to discover your passion. Passion is the key to blogging—it’s what keeps you doing it even in the early stages when no money is coming in. You have to determine what yours is and how you’ll use it to drive your blog. Your readers will sense your passion—or its absence. Picking the right domain name. A domain name is more than just a name—it can define what your site is about and how search engines will see it . You’ll need to optimize it. How to use WordPress. WordPress is the most popular blogging platform for more reasons than can be listed here. It can take months just to figure out this one very important part of the blogging puzzle. You want to be able to do it in days instead. Changing WordPress themes. At some point you may want to freshen up your site by changing WordPress themes (there are many!). If you aren’t careful in doing this, you could be creating a lot of extra work for yourself. Creating blog posts. You just sit down and write articles, right? Nope! Some topics get read, others…not so much. And then there’s the matter of keywords. If you don’t get these right from the start, you could be working against yourself. Setting up your RSS and Feedburner. If you have a blog, people will want to subscribe to your site to get updated posts and other information. In order to do this you need to set up RSS and Feedburner. It’s tricky at best, and can be a disaster at worst! Installing Google Analytics. This is how you track your traffic, your progress and just about every other metric you need to follow for your blog. This alone is a multi-step process. How to use widgets. These are invisible containers that hold much of what it is you want to add to your site, including advertisements. Not much money will come in if you don’t understand how they work. How to use plug-ins and which ones are the most effective. These are blog add-ons that enable you to manage comments, filter out spam, manage advertisements and subscriptions. It’s a major time and money saver just knowing which ones you need, which you don’t, which work and which might not. If you don’t know what some or most of these are, you need to get this program—it’s the crash course! One of the problems with starting a new venture of any kind is that you just don’t know what you don’t know, and that can very easily send you off in the wrong direction early. 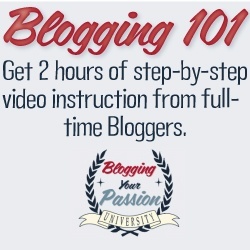 Take the easy path into blogging for beginners and check out the Blogging Your Passion University 101. 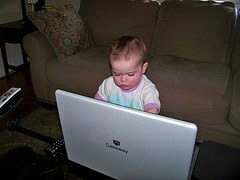 Have you started a blog recently, or do you plan to in the future? Great ideas! We’re in the process of possibly using another WordPress theme. Something that’s easily formatted to selling products and looks a little more professional. I didn’t even know what a blog was back in April. Now I’m trying to figure out this entire world of blogging. Thanks for the tips! Hi Whitney–That’s why it’s good to have a program to work from! Blogging only looks simple to the casual observer, but once you get into it it’s a real learning curve. Halt the time you don’t even know what you’re doing wrong, along the lines of “you don’t know what you don’t know.” If I had it to do all over, I’d get into a program like Blogging Your Passion University. Seriously, you can waste a lot of time and money trying to “wing it”. I’m also a strong believer that if you try something new and don’t see positive early results you’re far more likely to give up on it. It’s sad to think how many blogs might have taken off with some constructive direction early on. When I click on the link for Blogging Your Passion University 101 I opens up in Chinese? ?